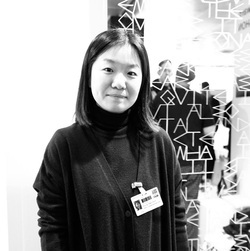 WW Contemporary Art presents Kyung Hwa Shon, winner of the 2015 SOLO Award, selected by Sarah Monk (Director London Art Fair), Danielle Arnaud (Danielle Arnaud Contemporary Art), Fedja Klikovac (Handel Street Projects), Amba Sayal-Bennett (winner 2014 SOLO Award), and panel chair Chiara Williams (Director WW Contemporary Art). With her two new works, ‘The City of Fragments’, a large floor-based sculpture and ‘The Trace of Stillman’ an engraved mirror, Kyung Hwa Shon explores the reciprocal relationship between a city and the imagination, through the eyes of a city phantom called ‘Stillman’. The stencilled and engraved texts describe the personal psychological reactions and observations made while chasing Stillman’s traces. The work could perhaps be approached in the same way as the reader confronts the complex and shifting web of characters, identities and narratives in Paul Auster’s postmodern meta-detective story ‘City of Glass’, to which Kyung Hwa Shon here refers. There are no fixed questions and no final answers. 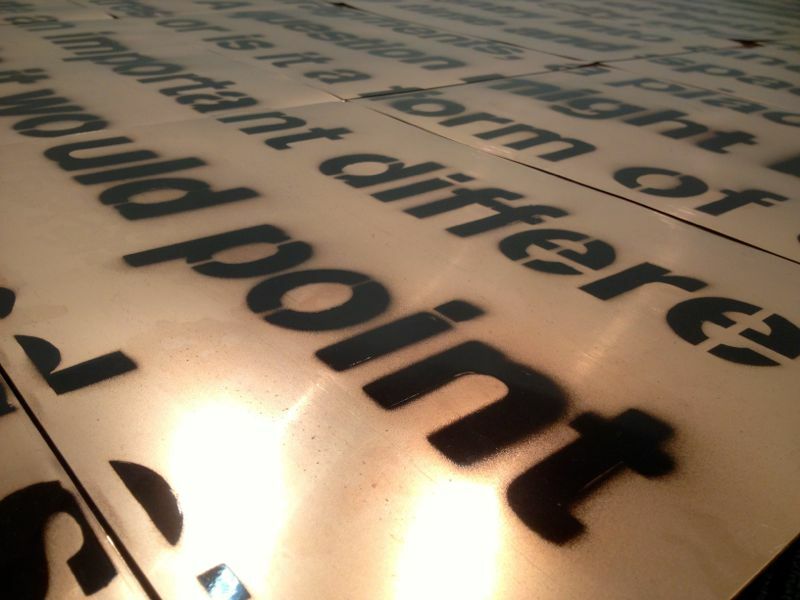 ‘The City of Fragments’, (which itself is a stand-alone fragment of a vaster installation), is composed of copper sheets bearing stencilled text laid out on the floor. Some sheets of text are missing. It feels like the point may be missing. The uncovered, invisible remnants of ‘Stillman’ make the city a field of excavation where everything is buried, hidden, and remaining undiscovered. The work implies the unfolding of an urban landscape into a distinct poetics of the city in which mythology, sign, symbol, voice, text, and trace occurs. The myriad ambiguous signs and markings of the street, the fragmented and specular images of shop-window displays, these are crucial signposts for the artist as she navigates the city through the prism of her imagination. 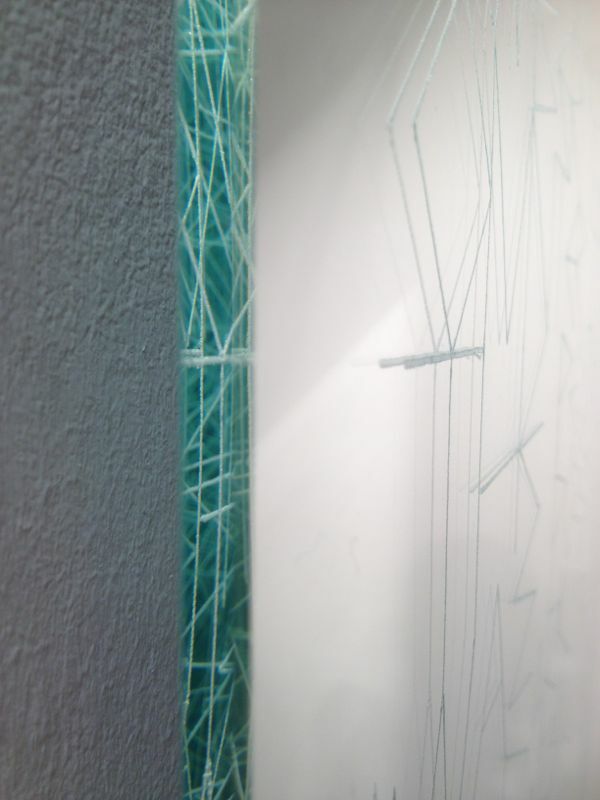 ​Kyung Hwa Shon (born 1983) lives and works in London and Seoul. She is currently studying for a PhD in Painting at the Royal College of Art. Prior to this she obtained an MFA in Painting and Drawing at the School of the Art Institute of Chicago, USA and completed a BFA in Painting at Hong-Ik University in Seoul, South Korea. She also studied at the École Nationale Supérieure des Beaux-Arts in Paris, France. After her MFA, she became a Starr Scholar at the Royal Academy of Arts in London, UK. Shon has shown her work internationally at Royal Academy of Arts (UK), Seoul Olympic Museum of Art, Posco Art Museum and SeoungNam Arts Centre (Korea), Korean Cultural Service New York (USA), Cozinha Gallery at the University of Porto (Portugal), and Korean Cultural Centre, (UK). Recent exhibitions include ‘UK/RAINE’, Saatchi Gallery, London, UK, 2015; ‘Mindful Mindless’, Seoul Olympic Museum of Art (SOMA), Seoul, Korea, 2015; ‘Uncovered Invisible Remnants’, University of Porto, Portugal, 2015; ‘You never look at me from the place which I see you’, Blyth Gallery, Imperial College, London, UK, 2015; ‘The Great Artist’, Posco Art Museum, Seoul, Korea, 2015; ‘Why Would I lie?’, Research Biennial, Royal College of Art, London, UK, 2015. Concurrent to her presentation at the London Art Fair, Shon also has a solo exhibition at Alternative Space Loop in Seoul, Korea, in 2016. Shon is recipient of numerous prizes, most recently the Solo Award and the Alternative Space Loop Art Prize. 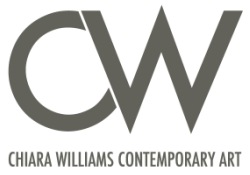 WW is a contemporary art gallery, now focused on consultancy and a limited number of specialist annual projects, such as the SOLO Award. Established in 2008, WW built a reputation as one of London’s leading contemporary artist-run spaces, curating consistently forward-thinking and innovative projects, totalling over 65 exhibitions and projects during its first 6 years, including collateral UK exhibitions at the 53rd & 54th Venice Biennales. During this time it represented 8 artists and supported the work of more than 300 artists, curators and writers through exhibitions, exchanges, collaborations, residencies, off-site projects, commissions, talks and publications.